Heat the oven to 400°F. Beat the egg and water in a small bowl with a fork or whisk. Season the chicken with the black pepper, if desired. Heat the butter in a 10-inch skillet over medium-high heat. Add the chicken and cook for 10 minutes or until it's well browned on both sides. Remove the chicken to a plate. Cover the plate and refrigerate for 15 minutes or up to 24 hours. Unfold the pastry sheet on a lightly floured surface. Roll the pastry sheet into a 14-inch square. Cut into 4 (7-inch) squares. Spread about 2 tablespoons cheese spread in the center of each pastry square. 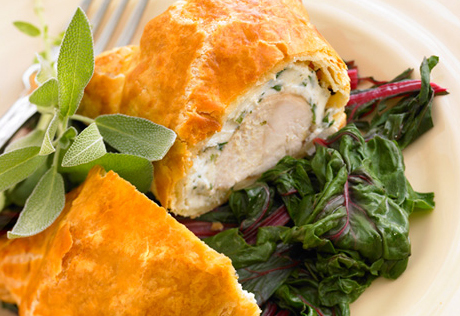 Top each with 1 tablespoon parsley and 1 chicken breast. Brush the edges of the pastry squares with the egg mixture. Fold the corners of the pastry squares to the center over the chicken and press to seal. Place the filled pastries seam-side down onto a baking sheet. Brush the pastries with the egg mixture. Bake for 25 minutes or until the pastries are golden brown. Let the pastries cool on the baking sheet for 10 minutes. Serving Suggestion: Serve Bibb lettuce wedges with tomatoes and basil and Italian dressing. For dessert serve coffee ice cream with butterscotch sauce and whipped cream.